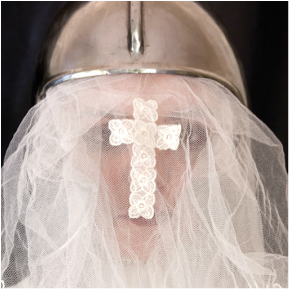 Pope Joan, Digital Print, 40x40cm, 2015, Stories of Origin, Dublin, 2015. The Marian Thread, Digital Print, 20x23cm, 2013. The Dead End of Culture, Glasgow 2007, Digital Print 20x23cm, 2007. Born in Glasgow, 1962, artist, Annemarie Murland migrated to Australia in 1990. It was at this juncture that she comprehensively began to examine the complexities of her identity and sense of belonging, a side effect of her migrant experience. Murland is an advocate for women's stories of migration and how they can positively impact and develop a sense of community and culture. And, in a broader context, provide a framework for her research and contemporary art practice that aims to deliver the viewer with a materially significant felt experience. At the same time, the artist also acknowledges the voices of her maternal ancestors who migrated from Ireland to Scotland in the mid-1800s. Largely marginalised, these women went on to find their voice in the community through sharing tacit knowledge and their skills in knitting and weaving. Annemarie Murland retains an academic teaching profile and exhibits nationally and internationally while maintaining a studio practice in Newcastle NSW. Annemarie Murland is an accomplished artist with an exemplary academic record, receiving a University and Faculty Medal for her Honours Degree submission and earned a scholarship for the duration of her Ph.D. candidature (completed 2009). Murland’s interdisciplinary artistic practice, research, and collaborations continue to seek and define the multifaceted nature of visual praxis within the context of Women’s Stories of Migration and the broader space of contemporary visual culture. Dr. Murland is currently employed at the University of Newcastle where she is the course coordinator of Visual Art, Foundation Studies at the Ourimbah and Callaghan campus. She previously lectured and tutored [2006-14] in the School of Fine Art undergraduate and postgraduate program, practice and theory at the University of Newcastle, NSW, Australia. Dr Annemarie Murland exhibits nationally and internationally and maintains an active studio practice in Newcastle, NSW. Doctor of philosophy: awarded in 2009. Entitled: Migration Memory and Landscape: Recontextualsing Personal Experience through the Vehicle of Abstraction illustrated Murland’s creative and intellectual skills through the development of a personal painting and drawing methodology that offered an alternate reading of the discordant relationships between the Scottish and Australian landscape. Along with a formal exegesis, the creative component incorporated poetry, documentary photography, video and an exhibition of paintings and drawings as an installation. This cross-disciplinary approach proved particularly effective in providing a visually literate means to explore a personal migrant experience within a contemporary global context. The opportunity to exhibit in Ireland, 2015, at the Centre for Creative, Dublin provided Annemarie with the space and the place to pay homage to her Irish ancestors, particularly the women in her life who were marginalised and disenfranchised due to their culture background and religious beliefs. The works, titled: Stories of Origin presented as a series of digital portraits and video installation that provided the framework from which to challenge a religious and social identity politics. Laced with cultural signs and symbols the portraits reflected a legacy of changing perspectives on how we know ourselves by contesting the central myth that locates the feminine as domestic and private, and the masculine as heroic and public. Annemarie has also been involved in local Arts Health initiatives and has collaborated in several creative research projects that were primarily concerned with the topic of migration and how cultural hierarchies affect the formation of identity structures from a feminist perspective. The collaborations employed experimental drawing strategies, material processes and a performance that, within the context of contemporary fine art contributed to existing dialogues in this area of study. Murland’s contemporary abstract painted works of art form as part of the University of Newcastle’s international collection that comprises of over one thousand works of art, which exhibits the best of both regional and national works. Annemarie’s works of art also form as part of Maitland Regional Art Gallery collection and several other international private collections.